UPDATED — MIAMI (CNS) — Like the rest of South Florida, the Archdiocese of Miami was carefully watching the path of Hurricane Matthew, a Category 4 storm that began pounding Haiti and Cuba Oct. 4 and was expected to hit Florida’s Atlantic coastal area late Oct. 6. Chief among the preparations was prayer. Miami Archbishop Thomas G. Wenski asked all South Florida parishes to include prayers for those affected in their daily Masses in the days ahead. About 1.5 million Floridians were already fleeing their state to take shelter elsewhere. The archdiocese also was preparing to provide aid to the Caribbean nations hardest hit by Matthew, especially Haiti, Cuba, Jamaica and the Bahamas. Calls made by Catholic News Service to the headquarters buildings of the Diocese of St. Augustine and the Diocese of Savannah, Georgia, were met with busy signals — unusual in an era call-waiting and voicemail. The St. Augustine diocesan website contained a grid of Catholic school openings and closures. All schools were closed Oct. 7, the day Hurricane Matthew passed through the diocese, and most schools had already been declared closed Oct. 10. In the Miami Archdiocese, Deacon Richard Turcotte, CEO of Catholic Charities, said the archdiocese established contact with Catholic Relief Services’ Caribbean representative, who is stationed in Honduras and has responsibility for Cuba, Jamaica and Haiti. 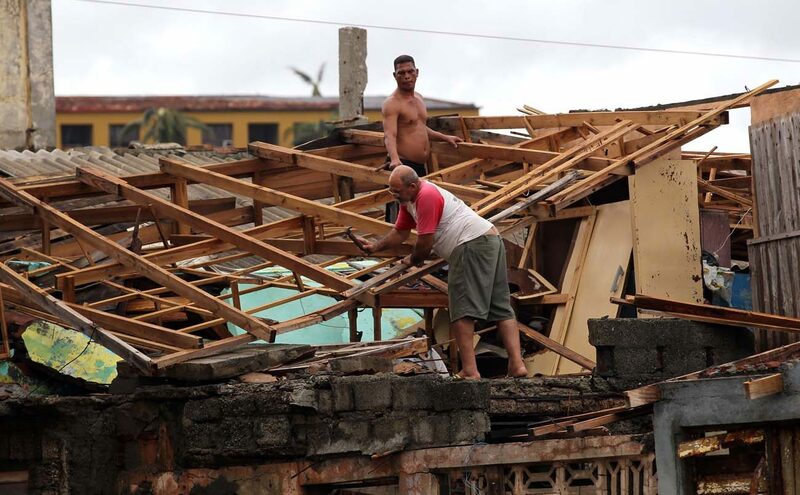 “CRS has prepositioned supplies in the Dominican Republic (tarps, hygiene and cooking kits) that can be moved to Cuba or Jamaica if needed,” Deacon Turcotte told the Florida Catholic, newspaper of the Miami Archdiocese. Although the island avoided a direct hit, Jamaica experienced serious flooding caused by Matthew’s outer bands. Haiti, meanwhile, felt the full impact of the storm. It left southwestern Haiti, the poorest nation in the Western Hemisphere, in shambles after slamming into the country’s Caribbean coast Oct. 4. The cities of Les Cayes, on the southwest coast, and Jeremie, in the northwest, were said to be particularly hit hard by the strongest storm to strike the Caribbean region in a decade. Haitian officials said Oct. 7 that the death toll had reached 842. In Miami, Father Reginald Jean-Mary, pastor of Notre Dame d’Haiti Mission in Little Haiti, has been in touch with Haiti’s Cardinal Chibly Langlois, who heads the Diocese of Les Cayes. After striking Haiti and Cuba, the slow-moving storm continued on a northward path to batter the Bahamas. From there it was headed to the Florida coast. “We have spoken with Archbishop (Patrick) Pinder of Nassau and representatives from the Archdiocese of Kingston, indicating to each that we are on standby to assist with post-storm recovery,” Deacon Turcotte added. He said Catholic Charities also had communicated with a food supply wholesaler who could have rice, beans and cooking oils put on pallets and be ready to deliver to a freight forwarder by Oct. 7 or 8 to go to the islands. Regarding Haiti, the immediate need is for cash donations to purchase water and nonperishable food items, as well as to aid in the cleanup. All Miami archdiocesan aid would be funneled through church organizations such as Caritas Cuba; CRS, the U.S. bishops’ overseas relief and development agency; and Amor en Accion, a lay missionary group that works with Miami’s sister Diocese of Port-de-Paix in Haiti’s northwest region — the poorest in that nation. Teresita Gonzalez, executive director of Amor en Accion, noted that because the Catholic Church is already present in every one of the affected nations, its agencies offer the best and most effective way of providing relief. That is especially true in northwestern Haiti, where “there are no NGOs (nongovernmental organizations), only the church,” Gonzalez said. As Matthew moved closer to South Florida, the archdiocesan Office of Building and Property also reminded pastors and those in charge of parish plants to review their hurricane preparedness plans. Archdiocesan schools planned to follow the lead of public schools in Miami-Dade, Broward and Monroe counties on school closures. The archdiocese also will notify local radio and television stations regarding school closings or relief efforts. Rodriguez-Soto is editor of the Florida Catholic, newspaper of the Archdiocese of Miami. Contributing to this story was Mark Pattison in Washington.